Management of Neglected Lisfrancs Dislocation. Jawaharlal Nehru Medical College, 10, Nehru Nagar, Belgaum, Karnataka. India. Introduction: Lisfrancs Fracture dislocation is not commonly seen and it often goes missed leading to numerous complications. We present a case of neglected Lisfrancs fracture dislocation who presented after 1 month and its management. Case Report: A 27-year-old man came with the complaints of pain and swelling of the right foot following a fall from a motorcycle 1 month back. On Radiographic evaluation it showed presence Lisfrancs fracture Dislocation with comminuted fracture of the proximal phalanx of the great toe and distal fibula fracture. Closed reduction was attempted initially which was unsuccessful and was followed by open reduction which also failed. Reduction was then achieved using Wagner’s external fixation distractor device and supplemented with percutaneously passed screws. The external fixator was continued for 3 weeks followed by below knee cast for 6 weeks. The patient regained normal gait and returned to work and his previous physical activity level without recurrent dislocation. Conclusion: This report highlights the necessity of prompt open reduction and the need of external fixation to achieve and maintain reduction in case of neglected cases. We advocate this approach to achieve reduction in neglected cases where open reduction is unsuccessful. 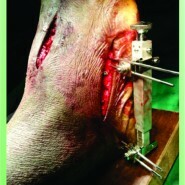 Keywords: Fractures/dislocation, foot, Lisfrancs, neglected, external fixator. Injuries of the tarsometatarsal (Lisfranc) joint are not common. They are rare, representing less than 0.2% of all orthopaedic traumas with a reported incidence of 1 per 55 000 individuals. These estimates are too low because 20% to 40% of these injuries are overlooked or misdiagnosed as foot sprain or isolated fractures of tarsals or metatarsals at first presentation and if left neglected they cause chronic foot pain due to arthritis of tarsometatarsal joint. [2,3] This is a unique and a rare case of neglected lisfrancs fracture dislocation. Few reported case of the same being treated with external fixator device to maintain reduction have been reported..
A 27 year old came to our outpatient department with complaints of pain and swelling of the right foot and a wound over the great toe since one month. He also complained of inability to walk due to the pain. He gave history of a road traffic accident 1 month back when he fell from a motor cycle. He consulted a local doctor for the same and was managed with dressing for the wound over the great toe. No further treatment was taken. The patient was a non smoker and he had no other habits. The patient also did not give any history of diabetes, hypertension and other morbidities. On physical examination, generalized swelling of the foot and tenderness of the dorsal aspect of the midfoot were present. The movement in the forefoot and midfoot was restricted and painful. Vascular and neurological examinations were normal. The skin was intact on dorsum of the foot and a cut lacerated wound was present over the great toe. Antero-posterior (AP) and lateral X rays of the right foot and ankle were done. 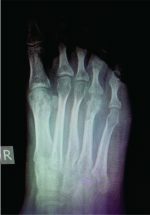 [Fig1&2] Lisfrancs fracture dislocation (type B2) was noted in the right foot with fracture of the base of the second metatarsal (Fleck Sign). Comminuted fracture of the proximal phalanx of the great toe and isolated fracture of the distal fibula were also noted. Patient was operated for the same immediately on presentation. It was carried out under tourniquet and patient was placed in supine position. The affected limb was placed on a foldable wooden plank to achieve various degrees of flexion so as to minimise assistance and to also take intraoperative dorso plantar X rays intra operatively. Closed reduction was tried first followed by open reduction with two incisions, one in the first web space and the second incision lateral to the fifth metatarsal. We could not achieve reduction with the same thus reduction was attempted with external fixator device. Two 4.5mm schanz pins were passed in the fifth metatarsal base and two pins in the calcaneum. Wagner distractor device was then applied and distraction was done [Fig 3&6]. Reduction was achieved and metatarsals were aligned with cuneiform and the cuboid. After reduction 2 cannulated cancellous (CC) screws were passed from 4th and 5th metacarpal bases to the cuboid bones and another screw was passed from 2nd metacarpal base into the intermediate cuneiform bone [Fig 4]. 4th CC screw was passed from the 1st metacarpal base into the 2nd metacarpal base. The fibula fracture was fixed using a 4mm CC screw acting as a lag screw and fracture of the proximal phalanx was treated with immobilisation using strapping and below knee slab application [Fig 5 &7]. The external fixator was continued for 3 weeks as the reduction was unstable when the fixator was being removed intra operatively. Below Knee cast was given after 3 weeks after fixator removal and continued for 6 weeks. The patient regained normal gait and returned to work and his previous physical activity level at 3 months without recurrent dislocation. At 6 months and 12 months follow up patient did not complain of any pain in the foot and also there was no evidence of osteoarthritis in the midfoot and forefoot [Fig 7& 8]. The term Lisfranc has been described as originating with French surgeon Jacques Lisfranc de St. Martin. He reported on midfoot injuries when cavalrymen would fall from their horses with a foot remaining plantar flexed in the stirrup during Napoleon Bonaparte’s military campaigns. The Lisfrancs complex is made up of both bony and ligamentous structures that provide support to the transverse arch of midfoot. Second metatarsal gets locked in between the cuneiform bones which provide the bony stability and the ligamentous stability is provided by the plantar and the intercuneiform ligaments, there is no tissue coverage dorsally. Injuries to the lisfranc joints are commonly seen in road traffic accidents and the mechanism of injury can both be direct and indirect. In direct mechanism there is crushing injury to the foot and no specific fracture patterns can be identified where as in the indirect mechanism there is violent plantar flexion or abduction force sustained to the foot. During the abduction force the 2nd metatarsal base gets locked in the cuneiform recess and sustains a fracture (Fleck Sign). As many as 20% of Lisfranc joint injuries are missed upon initial examination. In one of the series early radiographic diagnosis was in accurate in 23 out of 59 patients and other studies have shown that 20% were missed on presentation to the emergency department. [9,10] They are usually diagnosed by X rays of the foot (AP, 30° oblique and lateral views). The incidence of misdiagnosis is estimated at 20% using dorsoplantar and lateral radiographs. This may be decreased by employing comparison and 300 oblique views. A high index of suspicion must be maintained for these injuries, and additional imaging, stress radiographs, weight-bearing radiographs, CT or MRI performed as indicated. Although some controversy exists about the optimum method of treatment most authors now advocate anatomic reduction with internal fixation as the treatment method of choice. [10, 12, 13] On achieving reduction fixation is advocated with either screws (cannulated or uncannulated) or Kirschner wires. Screw fixation provides more stability but over compression may cause damage to the joint surfaces. Stabilization with Kirschner wires is simpler and the removal is easier, but fixation is less stable and there is always risk for pin track infections. Ebraheim et al have stated that dorsolateral displacement of the second metatarsal base of 1 or 2 mm results in reduction of the tarsometatarsal articular contact area by 13.1% and 25.3%, respectively. They have also stated that regardless of the modality, anatomic alignment needs to be maintained to decrease the risk of posttraumatic arthritis, chronic instability, and pain. Yamamoto et al presented a neglected case of lisfrancs fracture dislocation 14 months after being operated for the same with the injury being still unreduced. They performed an arthrodesis of the lisfranc’s joint for the painful and deformed foot. The neglected presentation of lisfrancs injury is a rare occurrence. In past neglected cases of the fracture have commonly been treated with arthrodesis of the lisfrancs joint to achieve a painless and functional foot. [15, 16] No cases of lisfrancs injury being reduced using a Wagner’s external fixator device and internal fixation using 4mm cannulated cancellous screws have been reported. We report such a case with anatomical reduction of the joint and fully functional foot after the duration of treatment. Lisfranc fracture dislocation is an uncommon injury and many cases go missed due to its rarity. It needs to be accurately diagnosed and it requires and prompt treatment in the form of closed / open reduction & fixation to avoid the various complications associated with this type of injury. Surgery should be done at an early stage to achieve reduction which on delay leads to difficulty. 1. Sands A, Grose A: Lisfranc injuries. Injury 2004, 35: S-B71-76. 2. Panchbhavi V, Vellurupalli S, Yang J, Anderson C. Screw fixation compared with Suture button fixation of isolated lisfranc ligament injuries. J Bone Joint Surg Am. 2009; 91: 1143-8. 3. Ramemelt S, Schneders W, Schikore H, Holch M, Heineck J, Zwipp H. Primary open reduction and fixation compared with delayed corrective arthrodesis in the treatment of tarsometatarsal (Lisfranc) dislocation injuries. J Bone Joint Surg Br. 2008 Nov; 11: 1499-1506. 4. Chandran P, Puttaswamaiah R, Dhillon MS, Gill SS. Management of complex open fracture injuries of the midfoot with external fixation. J Foot Ankle Surg. 2006 Sep-Oct;45(5):308-15. 5. W H Cassebaum. Clinical Orthopaedics and Related Research 30:116 (1963). 6. Peicha G, Labovitz J, Seibert FJ, Grechenig W, Weiglein K, Preidler F, et al. The anatomy of the joint as a risk factor for Lisfranc dislocation and fracture dislocation: an anatomical and radiological case control study. J Bone Joint Surg [Br] 2002;84-B:981–5. 7. Nunley JA, Vertulllo CJ. Classification, investigation, and management of midfoot sprains: Lisfranc injuries in the athlete. Am J Sports Med 2002;30(6):871–9. Fig. 4. Plain X-ray (AP and lateral) of the right foot showing screw fixation. 8. Trevino S, Kodros S: Controversies in tarsometatarsal injuries. Orthop Clin North Am 1995, 26:229-238. 9. Vuori JP, Aro HT. Lisfranc joint injuries: trauma mechanisms and associated injuries. J Trauma. 1993 Jul; 35(1):40-5. 10. Arntz CT, Veith RG, Hansen ST (1988) Fractures and fracture dislocations of the tarsometatarsal joint. J Bone Joint Surg [Am] 70:173–181. 11. Goossens M, DeStoop N. LisFranc’s fracturedislocations: etiology, radiology, and results of treatment. Clin Orthop. 1983; 1 76:154-162. 12. Myerson MS, Fisher RT, Burgess AR et al (1986) Fracture dislocations of the tarsometatarsal joints: End results correlated with pathology and treatment. Foot Ankle Int 6:225–242. 13. Richter M, Wippermann B, Krettek C et al (2001) Fractures and fracture dislocations of the midfoot: Occurrence, causes and long-term results. Foot Ankle Int 22:392–398. 14.Leibner ED, Mattan Y, Shaoul J, Nyska M. Floating metatarsal: concomitant Lisfranc fracture-dislocation and complex dislocation of the first metatarsophalangeal joint. J Trauma 1997;42:549-52. 15.Yamamoto H, Furuya K, Muneta T, Ishibashi T. Neglected Lisfranc’s joint dislocation. J Orthop Trauma. 1992;6(1):129-31. 16.Sharon SM, Knudsen HA, Mann I. Delayed reduction of a dislocation at Lisfranc’s joint: a case report. J Foot Surg. 1977 winter; 16(4):162-6. 17. Ebraheim NA, Yang H, Lu J, Biyani A. Computer evaluation of secondtarsometatarsal joint dislocation. Foot Ankle Int. 1996; 17(11):685–689. 18. Yamamoto H, Furuya K, Muneta T, Ishibashi T. Neglected Lisfranc’s joint dislocation. J Orthop Trauma. 1992;6(1):129-31.